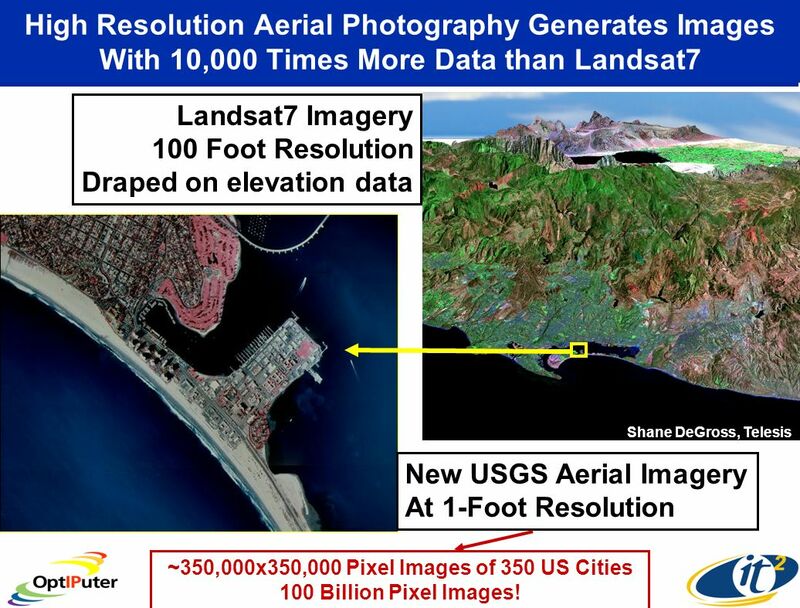 7 Landsat7 Imagery 100 Foot Resolution Draped on elevation data High Resolution Aerial Photography Generates Images With 10,000 Times More Data than Landsat7 Shane DeGross, Telesis USGS New USGS Aerial Imagery At 1-Foot Resolution ~350,000x350,000 Pixel Images of 350 US Cities 100 Billion Pixel Images! 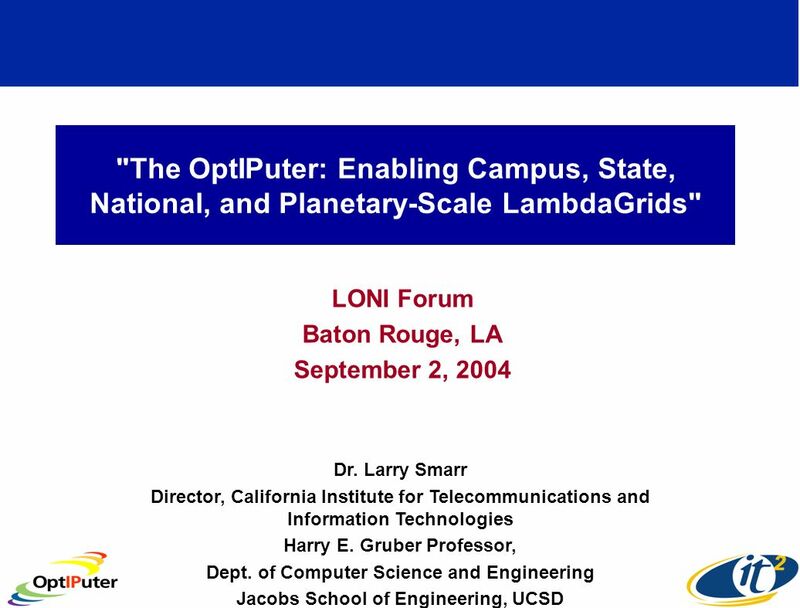 Download ppt ""The OptIPuter: Enabling Campus, State, National, and Planetary-Scale LambdaGrids" LONI Forum Baton Rouge, LA September 2, 2004 Dr. Larry Smarr Director,"
Electronic Visualization Laboratory University of Illinois at Chicago EVL Optical Networking Research Oliver Yu Electronic Visualization Laboratory University. 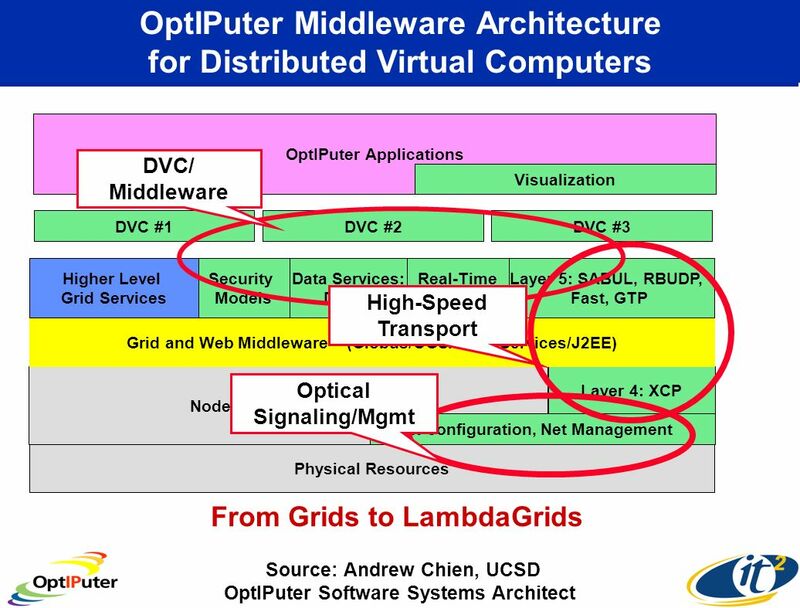 -Grids and the OptIPuter Software Architecture Andrew A. Chien Director, Center for Networked Systems SAIC Chair Professor, Computer Science and Engineering. 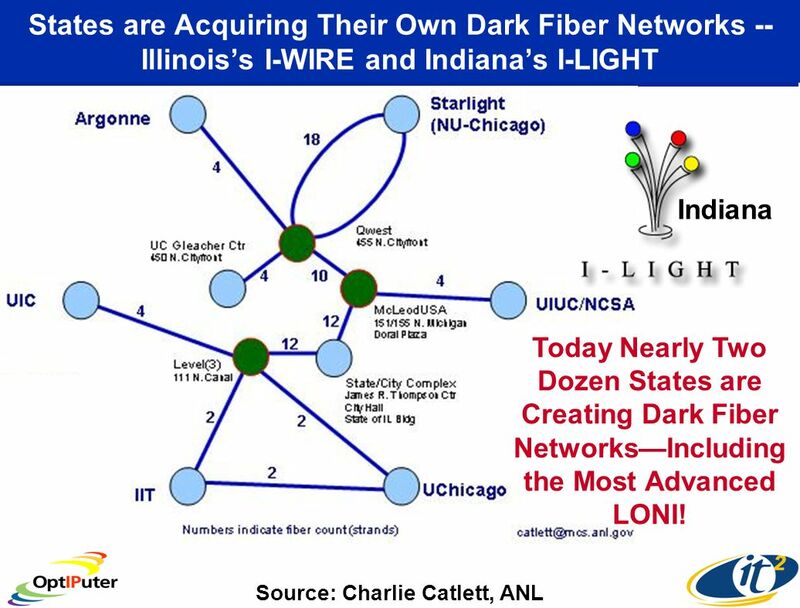 University of Illinois at Chicago The Future of STAR TAP: Enabling e-Science Research Thomas A. DeFanti Principal Investigator, STAR TAP Director, Electronic. 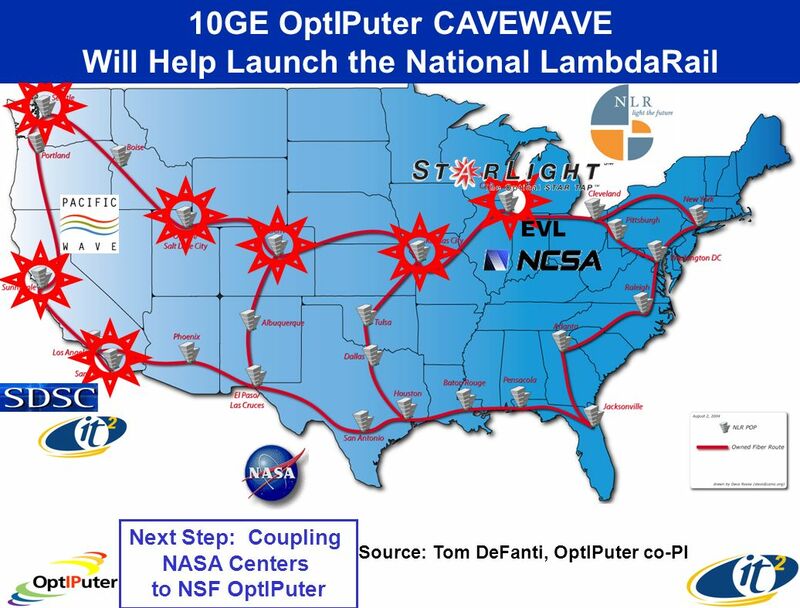 TransLight/StarLight Tom DeFanti (Principal Investigator) Maxine Brown (Co-Principal Investigator) Joe Mambretti (Investigator) Alan Verlo, Linda Winkler. 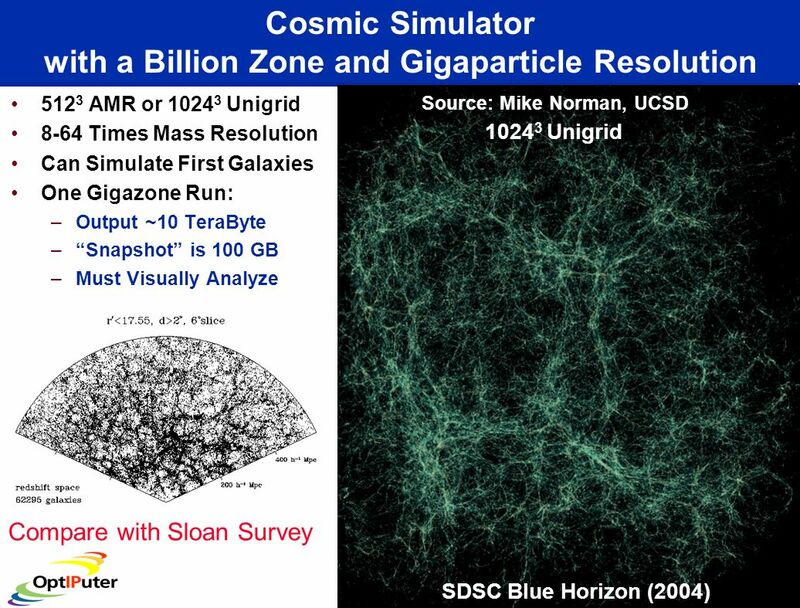 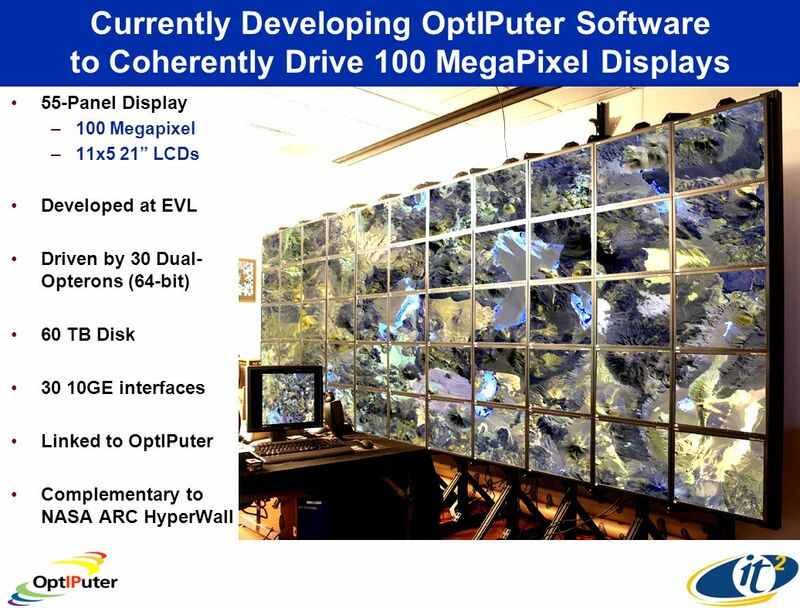 OptIPuter Goal: Removing Bandwidth Barriers to e-Science ATLAS Sloan Digital Sky Survey LHC ALMA. 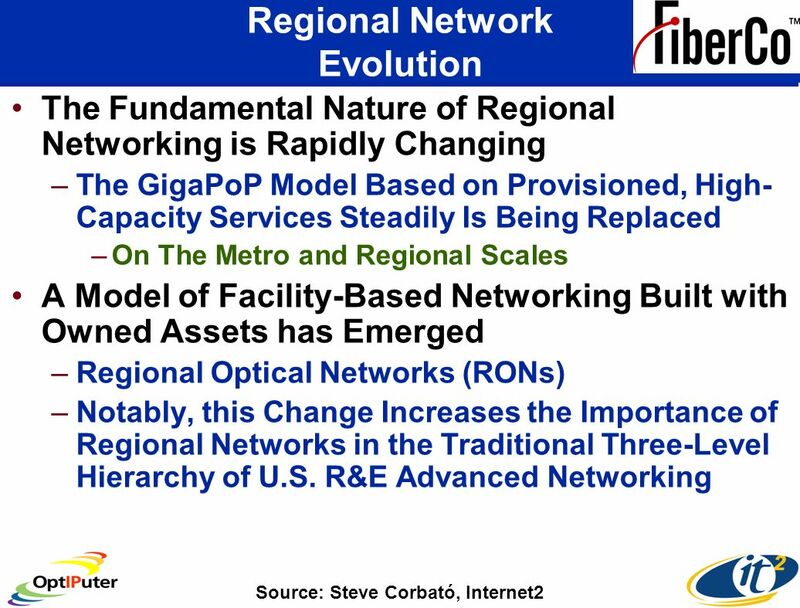 StarLight, the Facility Joe Mambretti, Tom DeFanti, Maxine Brown Alan Verlo, Linda Winkler. 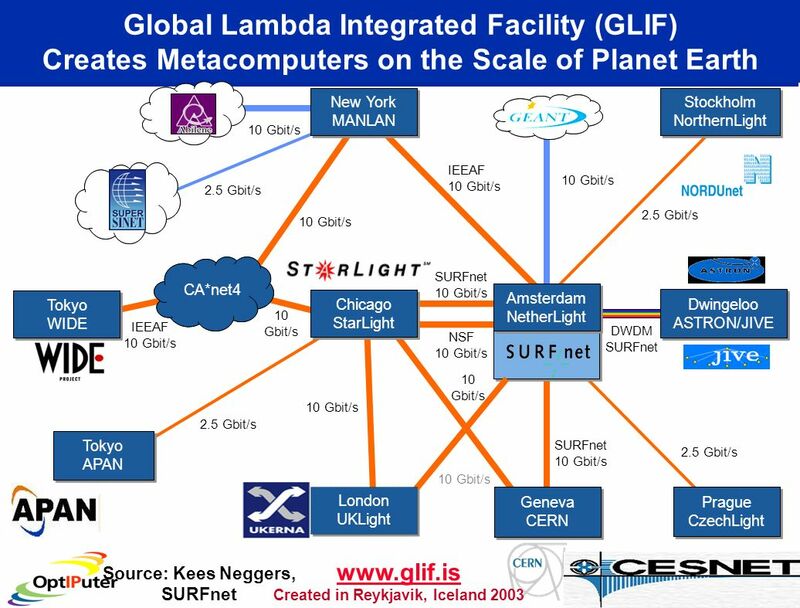 StarLight, TransLight And the Global Lambda Integrated Facility (GLIF) Tom DeFanti, Dan Sandin, Maxine Brown, Jason Leigh, Alan Verlo, University of Illinois. 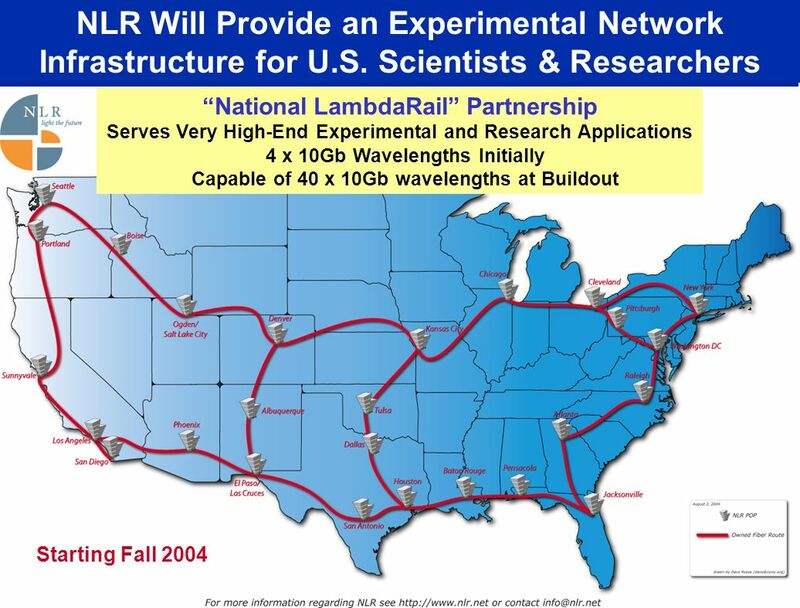 GLIF Global Lambda Integrated Facility Kees Neggers CCIRN Cairns Australia, 3 July 2004. 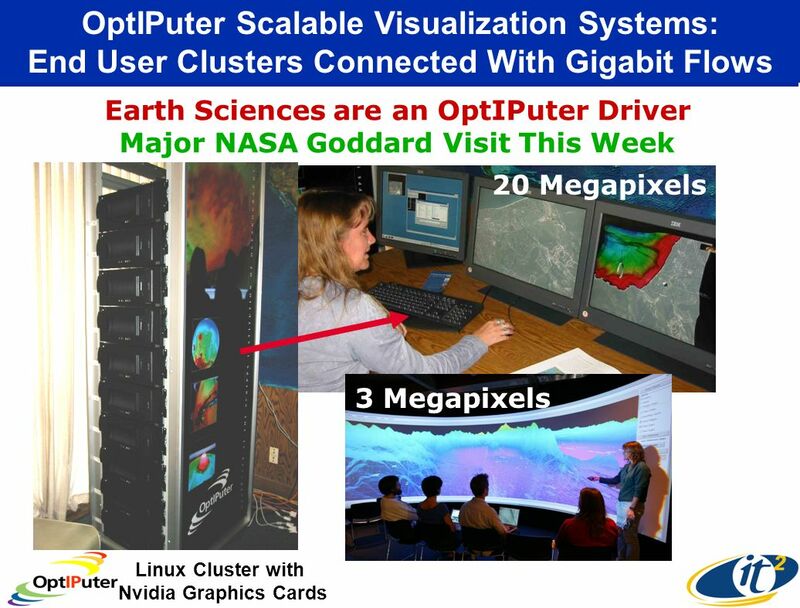 "Toward a Global Interactive Earth Observing Cyberinfrastructure" Invited Talk to the 21st International Conference on Interactive Information Processing. 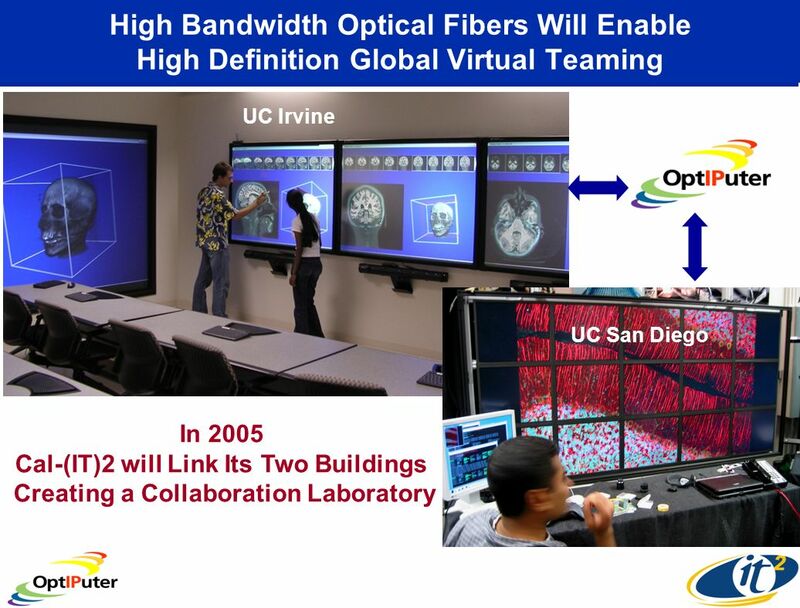 Calit2 " Talk Nortel Visiting Team December 12, 2005 Dr. Larry Smarr Director, California Institute for Telecommunications and Information. 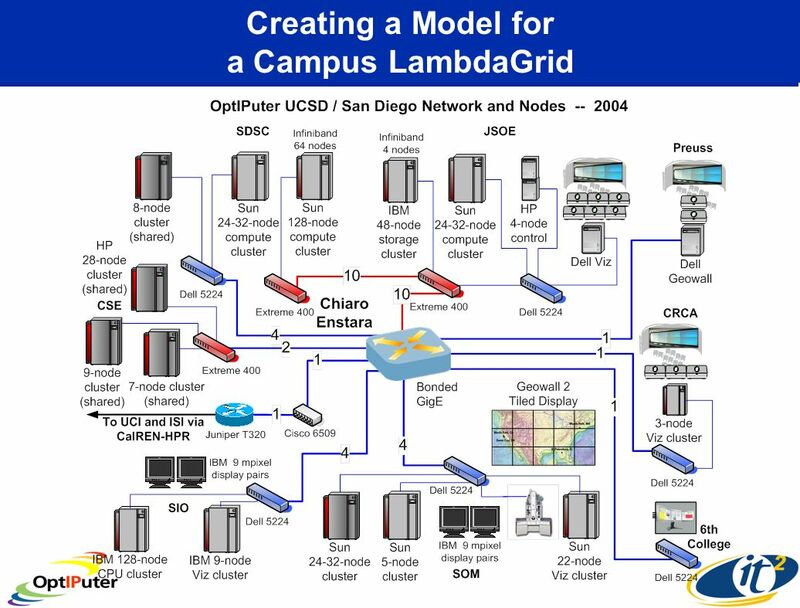 "The OptIPuter, Quartzite, and Starlight Projects: A Campus to Global-Scale Testbed for Optical Technologies Enabling LambdaGrid Computing Invited Talk. 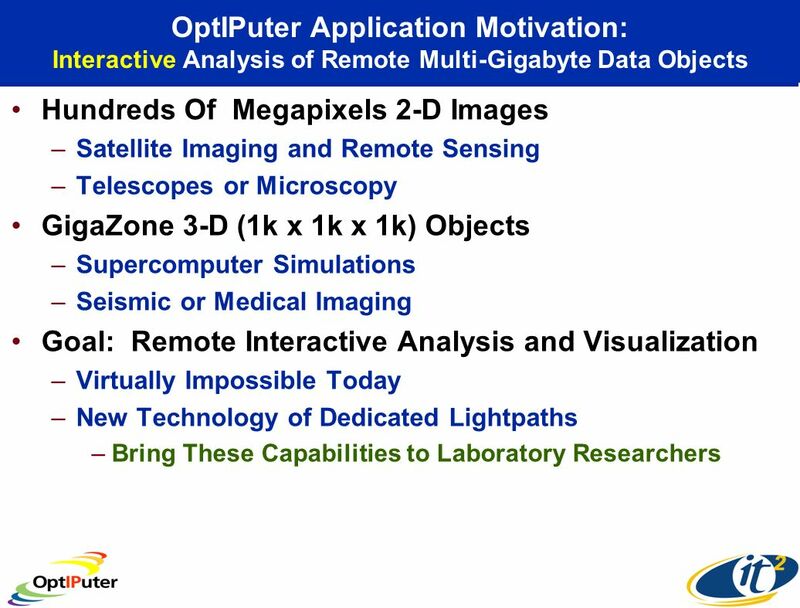 Analyzing Large Earth Data Sets: New Tools from the OptIPuter and LOOKING Projects Presentation to 3 rd Annual GEON Meeting Bahia Resort San Diego, CA. 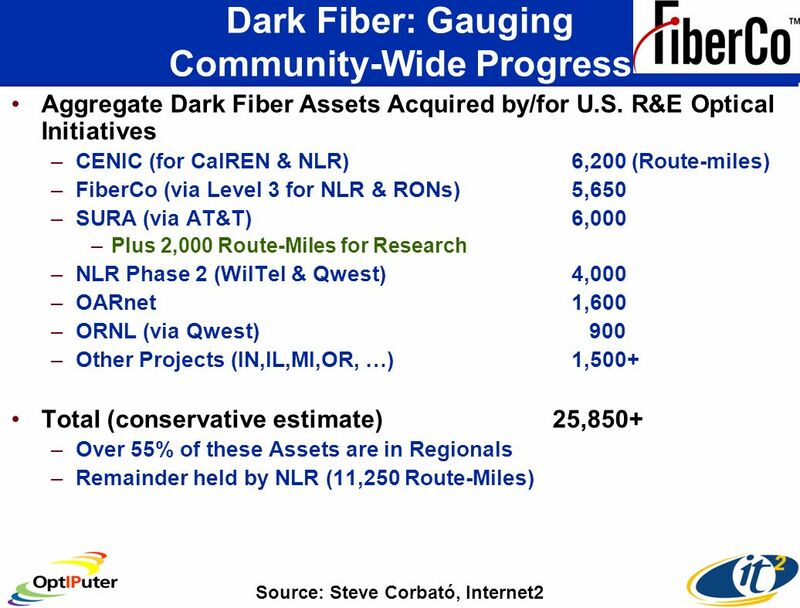 Creating High Performance Lambda Collaboratories" ONR Briefing ACCESS DC Arlington, VA March 25, 2005 Dr. Larry Smarr Director, California Institute for. 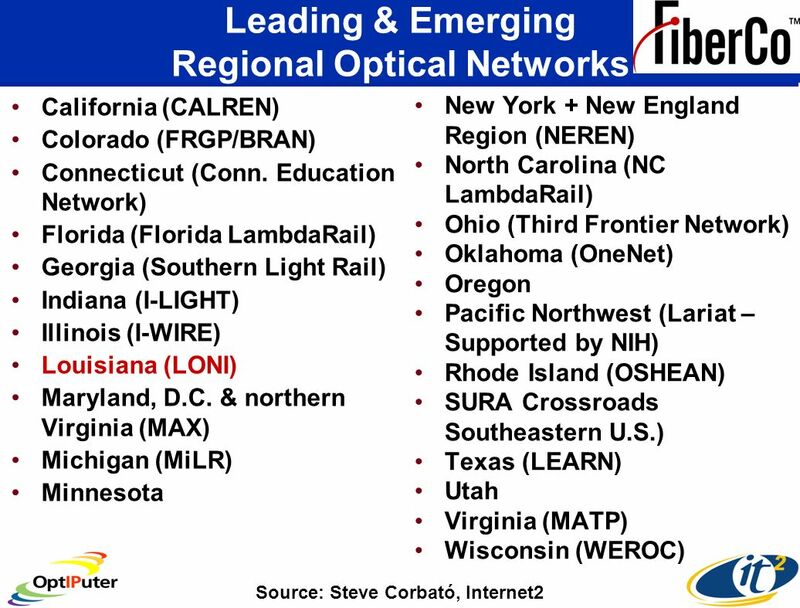 Bringing Mexico Into the Global LambdaGrid Dr. Larry Smarr Director, California Institute for Telecommunications and Information Technology Harry E. Gruber. 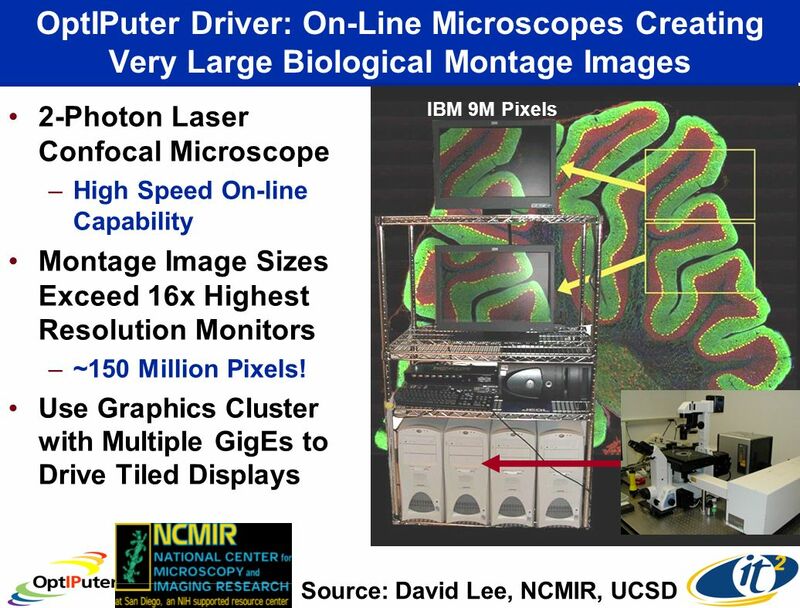 High Resolution Multimedia in a Ultra Bandwidth World After Dinner Talk IEEE ISM2005 Irvine, CA December 13, 2005 Dr. Larry Smarr Director, California. 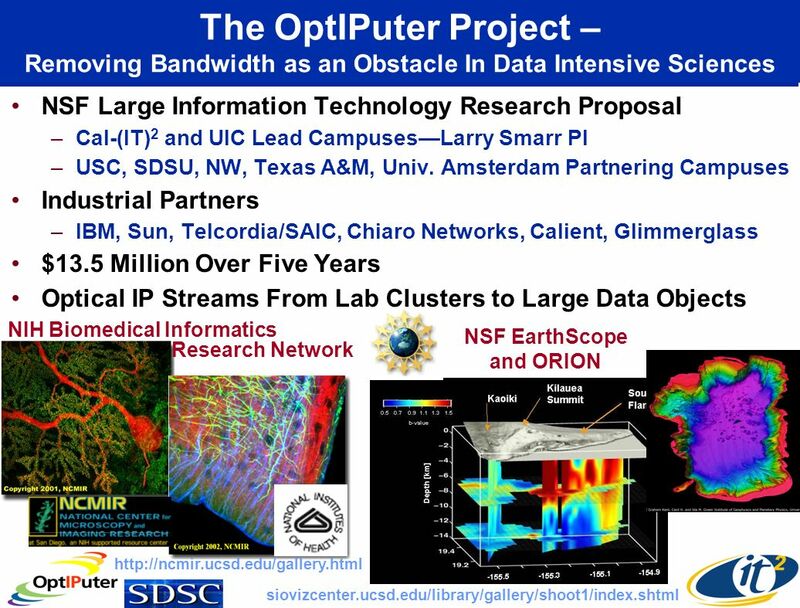 High Performance Cyberinfrastructure Discovery Tools for Data Intensive Research Larry Smarr Prof. Computer Science and Engineering Director, Calit2 (UC. 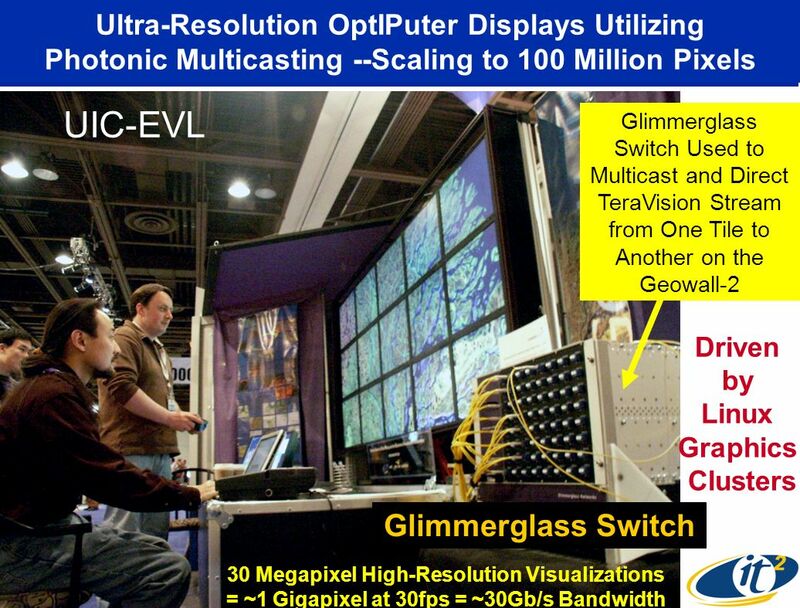 Why Optical Networks Are Emerging as the 21 st Century Driver Scientific American, January 2001. 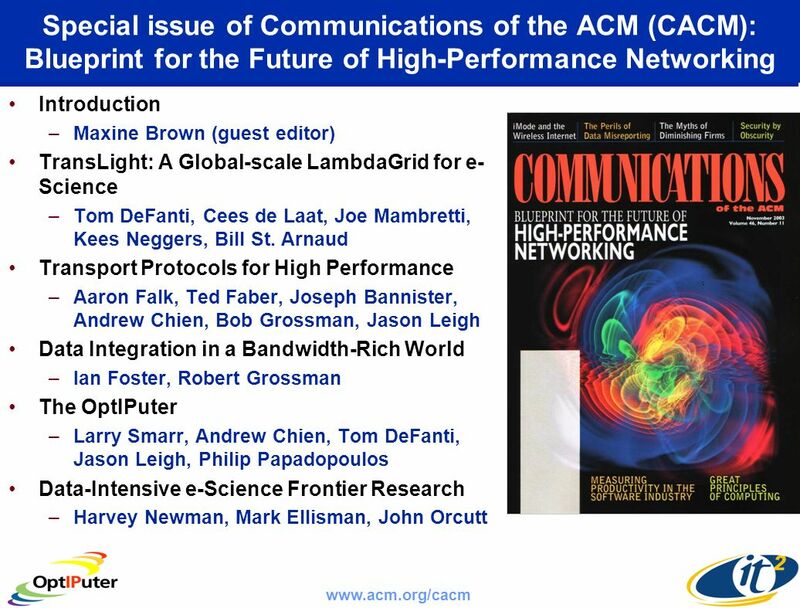 The Drive Toward Dedicated IP Lightpipes for e-Science Applications OSAs 6th Annual Photonics & Telecommunications Executive Forum Panel on "Back to the. 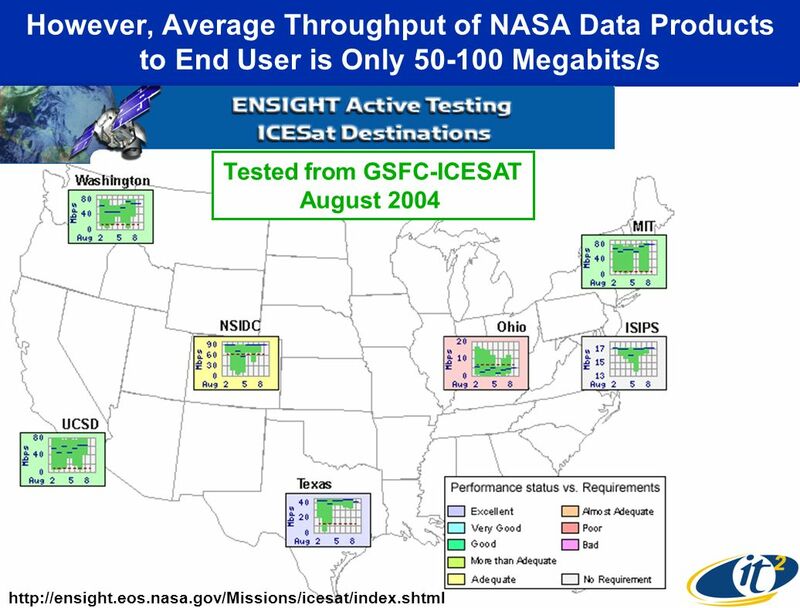 1 Earth System Science & Applications Advisory Committee Report Larry Smarr ESSAAC Chair NAC Meeting December 3, 2003. 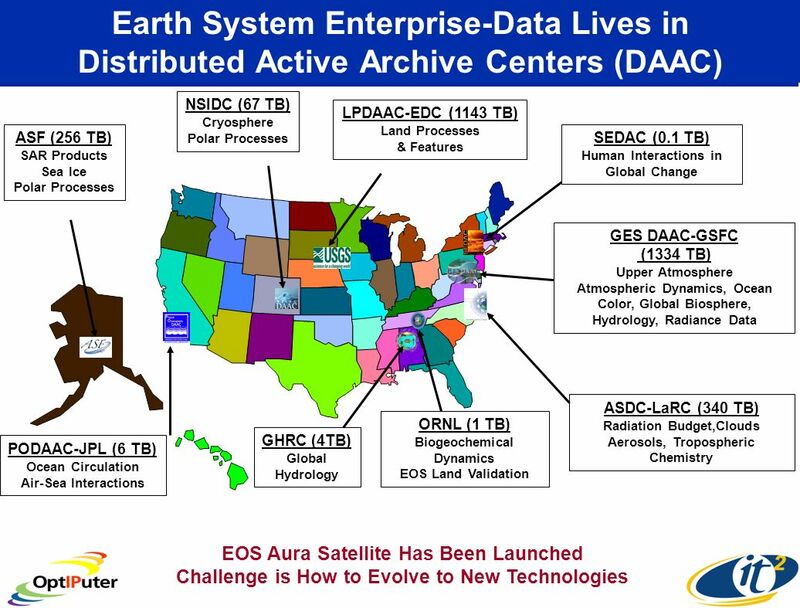 Earth Science Data and Information System (ESDIS) Project Update Jeanne Behnke, Deputy Project Manager for Operations NASA Earth Science Data & Information.